A yummy, really good, moist & flavorful cupcake topped with an obnoxious amount of delicious frosting. Recently I had one of those days when just such a cupcake was needed. I had a lone red velvet cake mix (Duncan Hines only please!) in my pantry and a bored toddler refusing to nap. So we fired up Mama’s kitchen aid mixer and made our cupcakes. Disclaimer: I am always a fan of “from scratch” goodies over store bought or boxed mixes, however, by adding an extra egg, sour cream, milk & oil, you can actually make a store-bought cake mix taste pretty darn good. 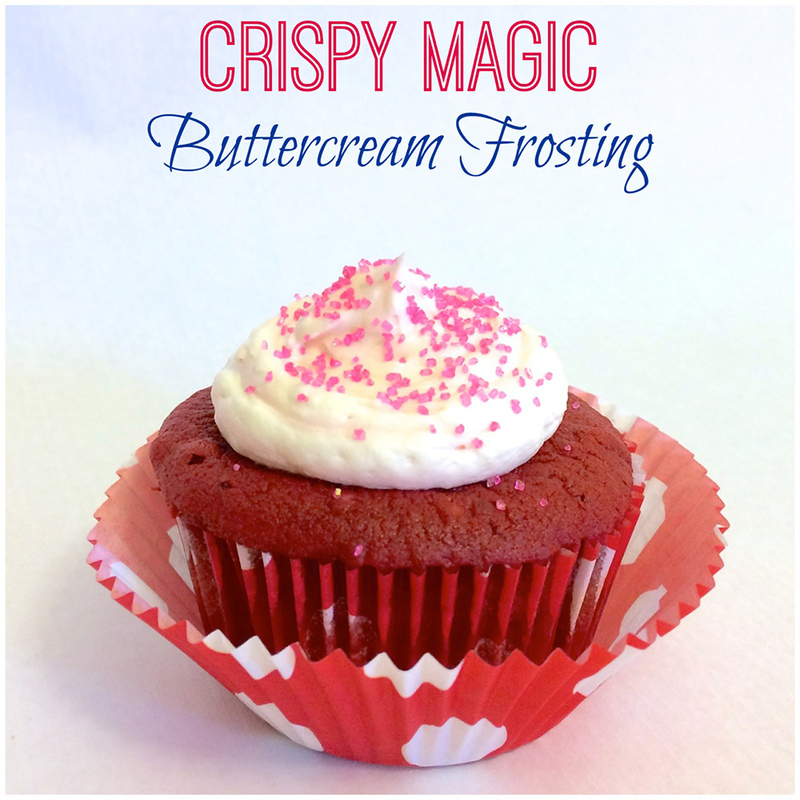 So grab a cake mix or use a favorite red velvet recipe, bake your cupcakes and allow to cool. Now for the good part: the frosting! There is never ever a time to use frosting in a can!!! I repeat: NEVER! Yes, store bought frosting is full of awful, hard-to-pronounce ingredients and most likely the now-taboo and dreaded trans fats. However, the taste is what is most unforgivable. Gross. It makes me mad just thinking about it. 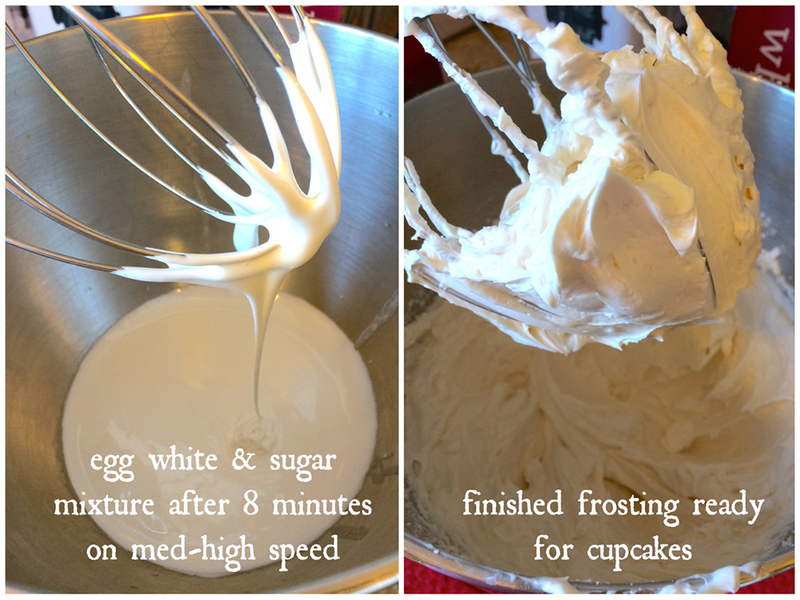 When homemade frosting is so much tastier and so quick and easy to whip up, why buy that gross can at the store? Vanilla buttercream is my all time favorite frosting. And my go-to, easy-peasy recipe is much like this one, using softened butter, powdered sugar, vanilla & a lil’ milk. Mix it all in one bowl with no complicated instructions. Delicious! Please promise me you’ll use this next time instead of buying the dreaded can?!! But I do love new recipes. This pin recently caught my eye and the frosting lover & connoisseur in me had to try it! 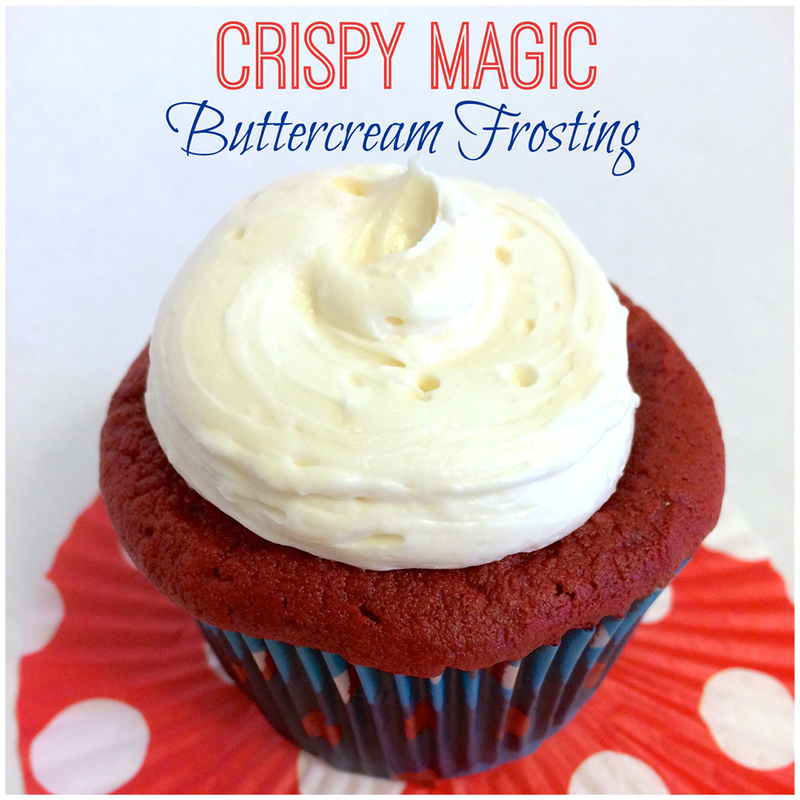 Crispy Magic Buttercream?!! Really!? I decided to pass on my favorite recipe this time and try this crispy magic for myself! Further research discovered the recipe originated from Flour, a cookbook from the famous bakery in Boston of the same name. I actually wasn’t wow’ed by the original recipe. So I tweaked it some and finally ended up with some crispy magic! If you love frosting with a slightly crunchy texture or prefer yours topped with sugar crystals or sprinkles… then you will love this recipe. The granulated sugar gives a nice little crunch to this frosting but isn’t overpowering or gritty. 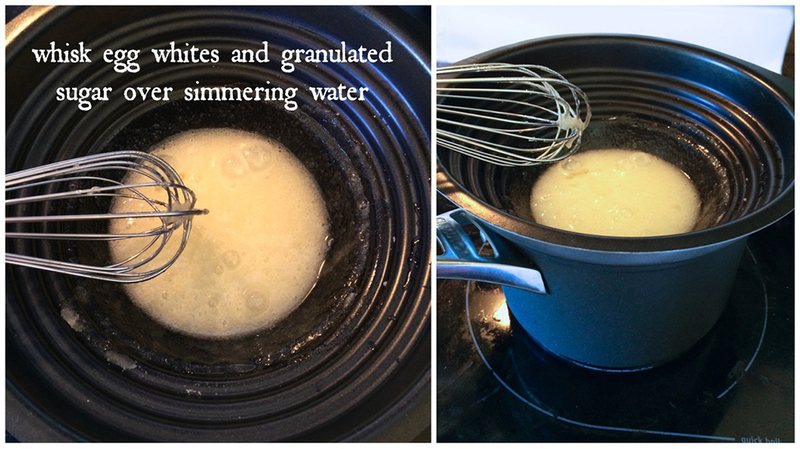 In a small, heatproof bowl, whisk together the granulated sugar and egg whites. Place the bowl over simmering water in a saucepan and heat, whisking occasionally, for 5 to 10 minutes, or until the mixture registers 160 degrees. It will thin out and turn white as the sugar melts. Transfer the cooked liquid to the bowl of a standing mixer fitted with a whisk attachment. Beat on medium-high speed for 6-8 minutes, reduce the speed to medium, add the butter a few pieces at a time, and continue to beat for another 5 minutes. 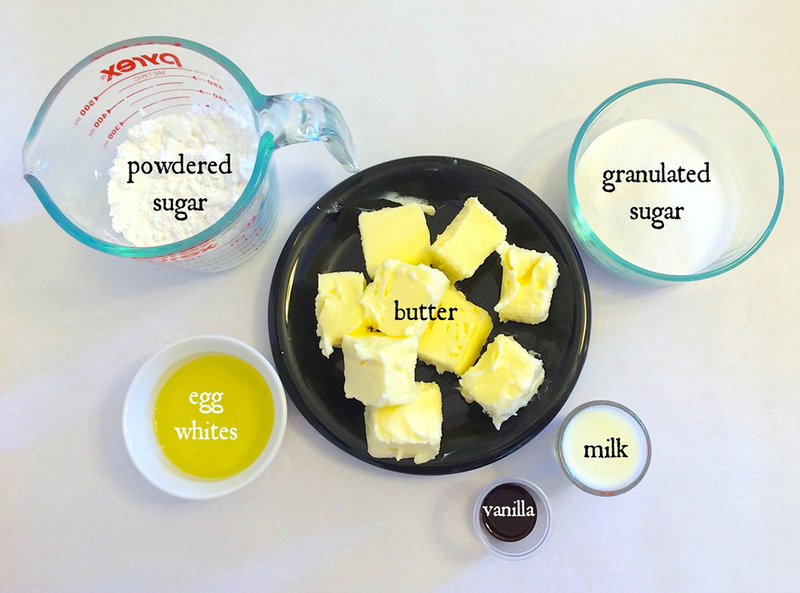 Reduce the speed to low and add the confectioner’s sugar, milk, and vanilla. Increase the speed to medium and beat until the frosting is completely smooth and holds its shape. Pipe or spread onto your cupcakes and enjoy!